We hope the Gastric Mind Band directions are useful! 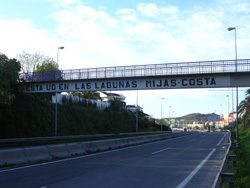 Gastric Mind Band Directions.Travelling along the N340 you pass two exits for Fuengirola and then you pass under a footbridge, which has the words ‘ Esta Ud. en las Lagunas Mijas Costa‘ written along it. Take the turn off straight after this footbridge – it’s literally immediately after you go under the bridge. 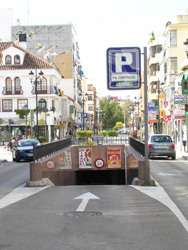 The exit is signposted to Coin as well asFuengirola. At the roundabout at the end of this exit road turn left, (the 3rd exit off the roundabout), so you are going underneath the N340 and heading towards the sea. You pass between two supermarkets – one called ‘Hiper Fu ‘ on the right and the other called ‘Dia ‘, on the left hand side. This road takes you straight into the town – keep going straight ahead all the way, across a slight dogleg crossroad and straight ahead after that. Keep going straight ahead (only a couple of minutes) until you reach a set of lights with a T-junction with a green ‘Unicaja’ bank in front of you. Turn left here and this is the main shopping street in Fuengirola. You will start to see clothes and shoe shops straight away and a big ‘Zara’ on the left. It’s only a very short distance from where you’ve just joined this road. (approx 150 meters). 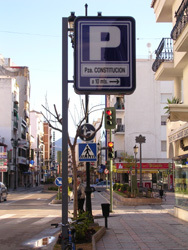 Look out for a big blue parking sign on the right just as you pass Zara – it’s marked ‘ Pza Constitucion a 10 mts‘. Turn right at the lights (there’s a shoe shop on the right hand corner and an optician’s and sunglasses shop on the left corner). You will see a large white church on your left as you turn. Keep to the left as you turn into this street – it takes you straight into the underground car park under the church square. After parking come back onto the street level and stand with the church behind you, so you are facing across the square towards the sea. Head towards the flower stall in the far right hand corner of the square, and you will also see la Caixa Bank on the corner. The clinic is in this street that leads off the square, by la Caixa Bank . It’s called Calle España. After the bank you pass 3 small clothes boutiques on the left hand side, then we are in the next building after that, diagonally opposite the post office ( Correos). Our building is called ‘ Edificio Buendia 1‘, and is painted white, with a glass front door and dark green iron railings. There’s a green and white sign to the left of the front door with ‘Elite Clinics’ on it, and another with ‘Gastric Mind Band’. We are on the 3rd floor in office 3A. This road takes you straight into the centre of the town. Keep going straight ahead across the roundabout and at the traffic lights. You pass both the local and the national police stations and then the Town Hall, all on the left hand side. When you see Zara on the left look out for the blue parking sign on the right marked Plaza Constitucion. Turn right at the lights (there’s a shoe shop on the right hand corner and an optician’s / sunglasses shop on the left corner). You will see a large white church on your left as you turn. Keep to the left as you turn into this street – it takes you straight into the underground car park under the church square. After parking come back onto the street level and stand with the church behind you, so you are facing across the square towards the sea. Head towards the flower stall in the far right hand corner of the square, and you will also see la Caixa Bank on the corner. The clinic is in this street that leads off the square, by la Caixa Bank. It’s called Calle España. After the bank you pass 3 small clothes boutiques on the left hand side, then we are in the next building after that, diagonally opposite the main post office (Correos ). Our building is called ‘Edificio Buendia 1, and is painted white, with a glass front door and dark green iron railings. There’s a green and white sign to the left of the front door with ‘Elite Clinics’ on it, and another with ‘Gastric Mind Band’. We are on the 3rd floor in office 3A. Gastric Mind Band Directions. Take the ‘Mijas ‘ exit from the motorway and follow the signs for Fuengirola at the roundabout (turning right). Keep straight a head along this road – you pass several furniture shops and car salesrooms on the right. Go straight on at each roundabout: the 1st has a petrol station on the left, the 2nd has Lidl on the left, the 3rd has another petrol station on the left, the 4th has Barclays Bank on the left and the 5th has an obelisk in the centre, and indoor market place called Mercacentro on the left and a Supersol supermarket on the right. As you go straight on at the obelisk roundabout, you pass the bus station on the right, and a taxi rank on the left. Turn right at the lights and follow this road for about 250 meters until you see an entrance to the underground car park in the middle of the road. Turn into the car park here. After parking come back onto the street level and stand with the church behind you, so you are facing across the square towards the sea. Head towards the flower stall in the far right hand corner of the square, and you will also see la Caixa Bank on the corner. The clinic is in this street that leads off the square, by la Caixa Bank. It’s called Calle España . After the bank you pass 3 small clothes boutiques on the left hand side, then we are in the next building after that, diagonally opposite the post office ( Correos). Our building is called ‘ Edificio Buendia 1‘, and is painted white, with a glass front door and dark green iron railings. There’s a green and white sign to the left of the front door with ‘Elite Clinics’ on it, and another with ‘Gastric Mind Band’. We are on the 3rd floor in office 3A. Gastric Mind Band Directions. As you come out of the station cross over the road which runs parallel to the sea, heading towards ‘Bookworld España’, and then go straight down the road which leads towards the sea. You will pass the bus station on the right hand side and a taxi rank on the left hand side. When you get to the crossroads just after the bus station you will see a sports shop straight ahead. Cross the road here and turn right, passing a shop called ‘Morena Rivera ‘, so you’re now walking parallel to the sea again and heading in the direction of Marbella . After 2 or 3 minutes you will see the big open square on the left hand side – this is ‘ la Plaza de la Constitucíon‘. Walk across the square in front of the church and head over to the far right hand corner, where you will see a flower stall and la Caixa Bank . The clinic is in this street that leads off the square, by la Caixa Bank . It’s called ‘ Calle España‘. After the bank you pass 3 small clothes boutiques on the left hand side, then we are in the next building after that, diagonally opposite the post office ( Correos). 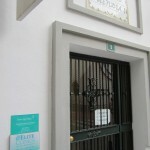 Our building is called ‘Edificio Buendia 1′, and is painted white, with a glass front door and dark green iron railings. There’s a green and white sign to the left of the front door with ‘Elite Clinics’ on it, and another with ‘Gastric Mind Band’. We are on the 3rd floor in office 3A. Gastric Mind Band directions. Face towards the sea and cross over the road towards the sports shop opposite. Turn right and follow this road which runs parallel to the sea, so you’re heading in the direction of Marbella. 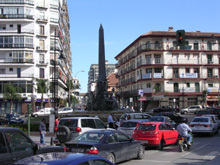 After 2 or 3 minutes you will see the big open square on the left hand side – this is ‘la Plaza de la Constitucíon ‘. Walk across the square in front of the church and head over to the far right hand corner, where you will see a flower stall and la Caixa Bank . The clinic is in this street that leads off the square, by la Caixa Bank . It’s called ‘Calle España ‘. After the bank you pass 3 small clothes boutiques on the left hand side, then we are in the next building after that, diagonally opposite the post office (Correos ). Our building is called ‘ Edificio Buendia 1‘, and is painted white, with a glass front door and dark green iron railings. There’s a green and white sign to the left of the front door with ‘Elite Clinics’ on it, and another with ‘Gastric Mind Band’. We are on the 3rd floor in office 3A. We hope the Gastric Mind Band Directions were helpful. Additional information regarding transfers from the airport etc can be found in the FAQ section of the site. Do feel free to phone us should you encounter any problems – 0034 951 311 591.